Dubai: One million young Arabs will receive free training in developing computer codes as part of a new initiative launched by His Highness Shaikh Mohammad Bin Rashid Al Maktoum, Vice-President and Prime Minister of the UAE and Ruler of Dubai, on Tuesday. The One Million Arab Coders initiative, part of the Mohammad Bin Rashid Al Maktoum Global Initiatives (MBRGI) foundation, seeks to equip young Arabs with the tools to build their future, starting with fluency in coding and programming. Aimed at providing Arabs with employment opportunities, the initiative will also empower them with the skills needed to contribute to the development of the digital economy. Present during the launch were Shaikh Hamdan Bin Mohammad Bin Rashid Al Maktoum, Dubai Crown Prince; Shaikh Maktoum Bin Mohammad Bin Rashid Al Maktoum, Deputy Ruler of Dubai; Mohammad Bin Abdullah Al Gergawi, Minister of Cabinet Affairs and the Future and Secretary-General of the Mohammad Bin Rashid Al Maktoum Global Initiatives, and a number of ministers and senior officials. The One Million Arab Coders initiative, managed by the Dubai Future Foundation, aims to empower one million young Arabs in the Middle East by training them, enriching their knowledge, improving their skills, providing them with jobs in the modern tech sector, and increasing their expertise in advanced science. This initiative is the first step to mastering coding, which will be crucial to meeting the requirements of the future digital economy. 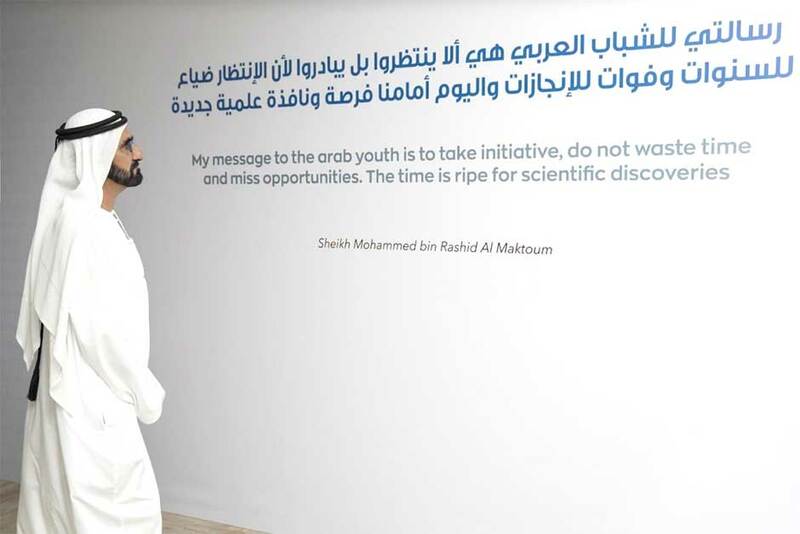 Part of Shaikh Mohammad’s vision to revive the Arab civilisation, and spread hope in the region through innovative and positive changes, the initiative will provide unparalleled training opportunities for free to young people in the region, while also rewarding top students and tutors with incentives exceeding $1 million (Dh3.67 million). “Coding will create many job opportunities for young people to compete; it will pave the way for them to participate in the global economy online, from home,” he added. Young Arabs, who make up the largest portion of Arab communities, are the main target of this initiative, which seeks to instill hope among them, and to invest in them so that they may build globally competitive communities on the solid pillars of knowledge and innovation. “This project is part of MBRGI’s mission to spread hope in the region, create employment opportunities and give our youth the skills needed for them to successfully lead our region into the future. From the world’s leading companies to the global economy itself, programming is the future, and we will support one million young Arabs so they can be an active part of this economic opportunity,” he said. Shaikh Mohammad invited youngsters to register on www.arabcoders.ae for the free programme and the best coders will be given cash prizes. The platform provides a specialised and integrated curriculum in computer science and programming, consisting of three months of training courses in cooperation with the world’s leading educational institutions and international companies. It will consist of three stages implemented over two years. First stage: Registering to join one of the two categories — Arab students or tutors from across the world. This stage can be completed through registration online at arabcoders.ae. Stage two: It requires applicants to complete several three-month virtual coding programmes. The top 1,000 students will then be selected, certified and will be enrolled in the Coder Challenge — the final stage. Stage three: It will involve the top 1,000 coders competing in the Coder Challenge for the top spot. At the end, the top ten students will be announced with the first-place winner receiving the grand prize of $1 million (Dh3.67 million), while the remaining nine will be awarded $50,000 (Dh183,500) each. The top four tutors, as voted by the students, will win $200,000 (Dh734,000) each. The One Million Arab Coders initiative targets young Arabs as they are a vital component of Arab communities. Studies show that 50 per cent of the Arab population is under 25 years and that 39 per cent aspire to establish their own businesses over the next five years. Meanwhile, unemployment rates among capable and ambitious young Arabs is at 28 per cent, which is one of the highest in the world. This initiative will support young Arabs, and give them the knowledge that empowers them to thrive in the IT sector. It is projected that by 2020, there will be 80 million jobs available in various IT sectors — this initiative seeks to carve out a space for Arabs to become part of that. The initiative will also enable young Arab innovators to play a key role in Smart Government, e-commerce and IT. The e-commerce sector has become a global $15-billion (Dh55 billion) industry, while the IT sector has reached $3 billion (Dh11 billion) in the Arab world alone, and is growing at an annual rate of 12 per cent. Dubai Future Foundation was launched to play a pivotal role in shaping the future of Dubai, especially in advanced technology. The foundation is part of MBRGI, which includes 33 institutions implementing over 1,400 development initiatives and humanitarian programmes, and which has been supporting over 130 institutions, government bodies, private sector entities and regional and international organisations.